Synopsis: A lavish train ride unfolds into a stylish & suspenseful mystery. From the novel by Agatha Christie, Murder on the Orient Express tells of thirteen stranded strangers & one man’s race to solve the puzzle before the murderer strikes again. Review: In my limited experience with Amtrak, I’ve come to the conclusion travel by train through the Midwest can be the most exciting way to be bored. There’s a rush of fun and thrill to board, find your seat, and sit back as the chugging engine moves you past the fields of wheat and country roads. Then that first half hour is over and you realize you have seven more to go until you reach your destination. I’ll admit that there were times when I wish there was something more exciting to do aside from looking forward to your time in the dining car. Not saying that murder would be a welcome addition to riding the rails but…it could spice things up a bit. 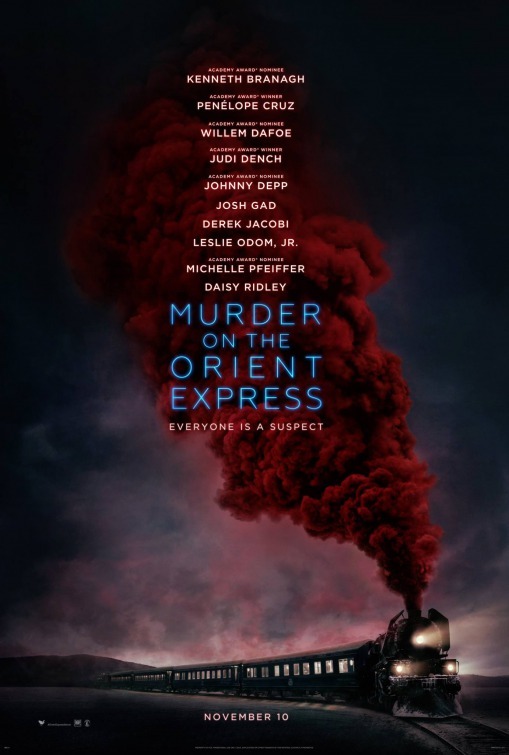 Maybe that’s why I was always such a fan of Agatha Christie’s sparkling 1934 novel, Murder on the Orient Express and its various incarnations on film and television over the years. I have a particular fondness for Sidney Lumet’s star-studded 1974 film that featured Albert Finney as Christie’s famed moustachioed detective, Hercule Poirot. Though too young for the role and padded enough to make him look like a Belgian Humpty Dumpty, Finney won me over (even if Christie didn’t care for him) and the ensemble cast of A-listers made solving the mystery Christie cooked up that much more fun. Poirot has ridden the Orient Express again in two more adaptations for television but he’s back onscreen under the guidance of director/star Kenneth Branagh (Jack Ryan: Shadow Recruit) and the results are similarly old-fashioned and quite fun. Many are going to have a problem with the relative cool tone of the film and it’s aloof star player. This is a movie that unspools slowly and with precision, taking care to present grand elegance instead of common luxury and nuanced performances in place of star cameos. I’m not saying it all works but, for me, it was the ride I was hoping for. On his way back to London to help with a case, Poirot finds himself on the famed Orient Express on a three day journey back from Istanbul. The train is unusually crowded at this late winter date so all compartments are occupied. En route, Poirot’s careful eye sees an unusual familiarity between two supposed strangers (Daisy Ridley, Star Wars: The Force Awakens and Hamilton’s Leslie Odom Jr.) and a sadness in a deeply religious missionary (Penelope Cruz, Zoolander 2). 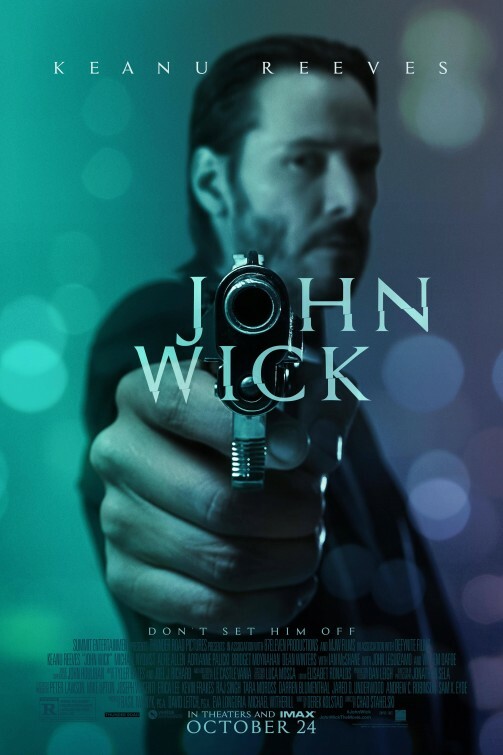 He spots a divide in the working relationship between an art dealer (Johnny Depp, Tusk) and his two employees (Derek Jacobi, Cinderella, and Josh Gad, Beauty & the Beast) and observes a brusque chill from a Russian Princess (Judi Dench, Skyfall) traveling with her maid (Olivia Colman, Hyde Park on Hudson). There’s also a strange German doctor (Willem Dafoe, The Florida Project) and a brash man-eater (Michelle Pfeiffer, mother!) keeping him occupied and, at the very least, entertained. It’s when the train derails in the middle of the night and one of the passengers ends up dead that Poirot’s brief bid for rest gets interrupted. There’s a killer onboard and the longer Poirot interrogates each passenger the more he begins to realize there are multiple suspects with the same motivation. Can he detect who done the deed before the rescue crews arrive and the train makes its way to its final stop? The solution to this one is a corker and those who know it won’t be surprised but Branagh and company want you to remember it’s the journey, not the destination, that matters. This is a handsome looking film and Branagh has captured it nicely in 65mm, preserving the lushness of the setting and maintaining the classic grain of a celluloid experience while keeping things crisp. The landscapes are almost entirely CGI (didn’t think Dench was going to get snowbound in the middle of nowhere did you?) but the period details are all practical and perfect. Cinematographer Haris Zambarloukos (Thor)works with Branagh to find interesting angles, such as the discovery of the body filmed from above which makes the audience feel like we’re watching rats in a maze. There are nice long takes as the camera moves throughout the train and everyone is framed to look their absolute best. Branagh will likely catch some heat for making the thrust of the film rely a bit too much on him. The magic of the previous movie was how well balanced Finney was with the rest of the actors; Ingrid Bergman even won an Oscar for her small role which is played here by Cruz. The interrogation scenes felt more intimate and personal there whereas under Branagh’s watch the interviews are brief and blunt. There’s a crime from the past that mysteriously links everyone on board and because it weighs so heavily into the solution there could have been better steps taken by screenwriter Michael Green (Blade Runner 2049) to lay the groundwork throughout the first ¾ of the film. I didn’t mind Branagh’s screen time, nor did I think twice about his crazy facial hair or thick Belgian accent. I liked his persnickety ways and it plays nicely off the rest of the cast who are allowed to be a bit more broad. The film ends with a hint that we might get more Poirot (Death on the Nile, from the sound of it) and I’d be up for another adventure with Branagh. Dench, as always, makes the most out of her role, easily nailing all of her character’s grand snooty comebacks. Gad and Depp are usually pain points for me but they play a good game here, both actors are restrained without feeling constrained. Ridely, Odom Jr., and Cruz might be far less memorable than previous actors that have played these roles but they acquit themselves nicely the more we get to know them. Lovely Pfeiffer is having a grand time playing a loudmouth widow, she looks gorgeous and Branagh even got her to sing a lullaby over the closing credits. Pfeiffer has a sweet, if thin, voice but it works for the song and the character. I always enjoyed watching the original film during the winter months on a cold day. It’s good timing this new version is coming out just as the temperature is dropping and snow is on the horizon. It’s a perfect film for a lazy day or sophisticated night out. 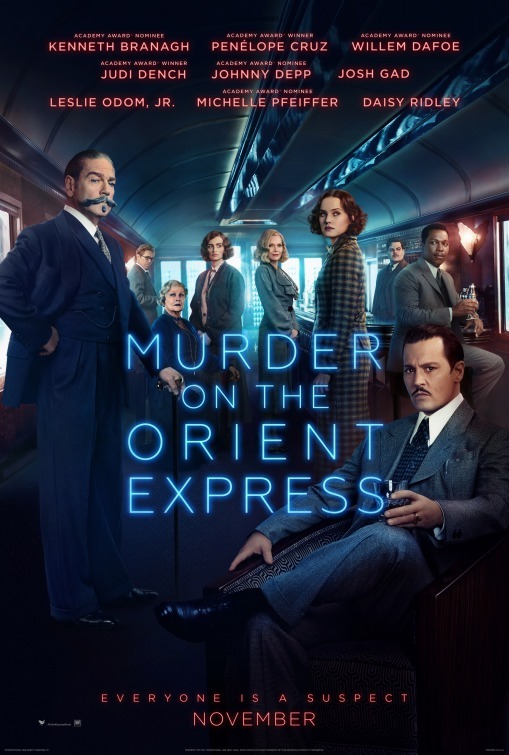 The deliberate pace and overall conservation of energy might bore audiences that just paid to see the brain smashing Thor: Ragnorok last weekend, but I’d encourage you to book passage on Murder on the Orient Express for another type of adventure. Synopsis: A lavish train ride through Europe quickly unfolds into the thrilling mystery of thirteen strangers stranded on a train, where everyone’s a suspect. One man must race against time to solve the puzzle before the murderer strikes again. Synopsis: Hazel and Gus are two teenagers who share an acerbic wit, a disdain for the conventional, and a love that sweeps them on a journey. Review: After reading several early rapturous reviews of John Green’s 2012 novel The Fault in Our Stars I, like all my good bandwagon hopping peers, snapped up a hardcover copy to say I owned it and then let it sit on the shelf where it gained a fine layer of dust. When it was announced in 2013 that the film version of the novel was hitting theaters in 2014 I dusted off the book and carried it around with me with the best of reading intentions…only to see it make its way back onto the shelf, unread. Suddenly, it’s 2014, I’m seeing the film in a week, and my guilty procrastinating personality kicks into high gear and I finally crack open the book. The rest is history…the kind of superior reading experience that maybe I was always destined to have. Green’s novel, told from the matter-of-fact perspective of a girl dying of lung cancer, was a humorous, heart-string tugger that never felt sorry for itself or resorted to cliché to keep its audience tearing through the pages. In the novel, love is found between protagonist Hazel and charming Augustus at the very worst time…when death is standing at the door. Too many films adapted from popular novels suffer by comparison because they either fail to capture what made the action on the page so special or change too much so the product is unrecognizable to fans. That’s not the case here, thankfully, so while it does retain some of the more problematic passages that made the novel perfectly imperfect, its devotion to being faithful made me respect it even more. I can’t say for sure, but had I not known while reading that Shailene Woodley (The Descendants, The Spectacular Now) was playing the lead I think I would have always imagined her in the role. As it is, after seeing Woodley’s sensitive take on the character I can’t imagine any actress out there today could have done the role justice as well as she does here. As in the novel, Woodley’s Hazel is strong yet vulnerable, direct but caring, and wise well beyond her young years. 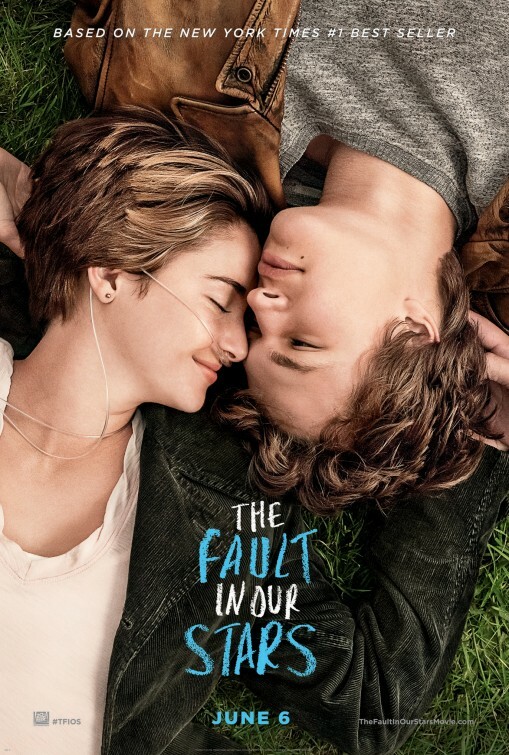 When she meets Augustus (Ansel Elgort, last seen playing Woodley’s brother in Divergent) in a cancer support group, she finds a kindred spirit that shows her she’s got a lot of living left to do…and wants to live it with her. Director Josh Boone teams with screenwriters Scott Neustadter and Michael H. Weber in bringing this sentimental tear-jerker to audiences without letting the film with such a melancholy subject feel too heavy. The beats are all in the right place and the film enjoys a good hour of splendid magic before veering (like the novel) into a subplot that (like the novel) just didn’t work for me. To say what this tangent is would be to betray what happens later in the film so I’ll merely say home is where the heart is. As far as differences between the novel and the film, most are too small to report back on. 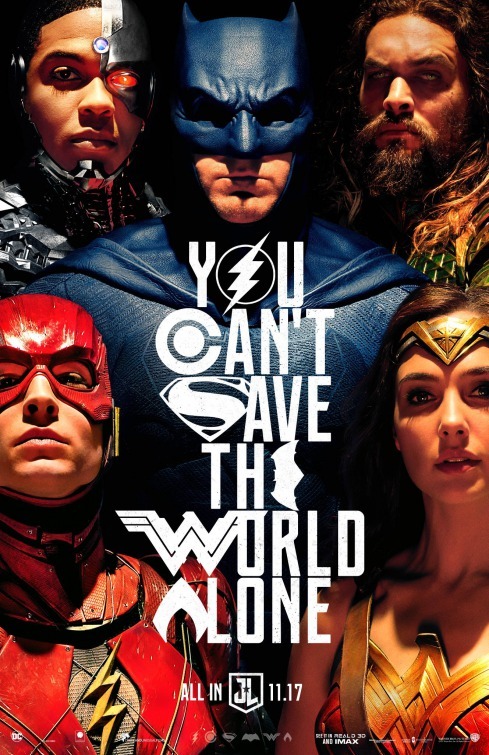 Even though the flash-forward opening moments of the movie had me on edge, it wasn’t the deal breaker it could have been in less devoted hands and thankfully, Boone and co. have figured out a way to smooth over (not change) the ending to be more cinematically sound. As Hazel’s dad, Sam Trammell isn’t as weepy as the novel implies, bringing a welcome stoicism absent on the page that makes him more equal partners with his wife and daughter. It’s hard to believe there was a time I wasn’t a fan of Laura Dern, never really warming to her performances. However Dern (Smooth Talk, The Master, Jurassic Park) delivers moving work here as Hazel’s mom, further cementing my admiration for her talent. Woodley and Elgort have chemistry for days, something the movie would have been D.O.A. without. Largely thanks to Woodley’s earthy presentation of a dying girl and Elgort’s laid-back approach to a devil may care boy The Fault in Our Stars becomes more than a disease of the week three hanky weeper. A well made film crafted by people who obviously cared about the book quite a lot, there’s little fault to be found here. A nice bit of counter-programming for audiences already weary with effects heavy blockbusters. 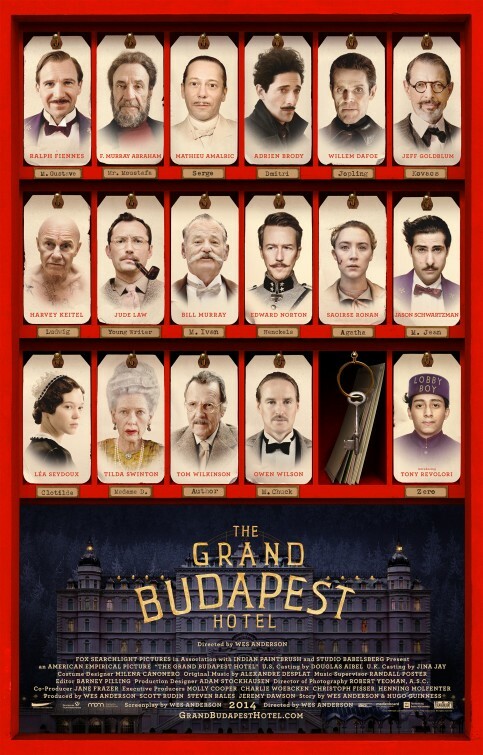 Thoughts: Are you ready for The Grand Budapest Hotel? No, really, are you ready? Because I have the inkling the first great movie of 2014 will arrive once Wes Anderson’s follow-up to Moonrise Kingdom opens its doors in early March. Anderson is an acquired taste and truth be told it’s taken me a while to really warm up to his style but if it’s half as precise as Moonrise Kingdom this one’s going to be another strong entry in Anderson’s growing list of cinematic treasures. 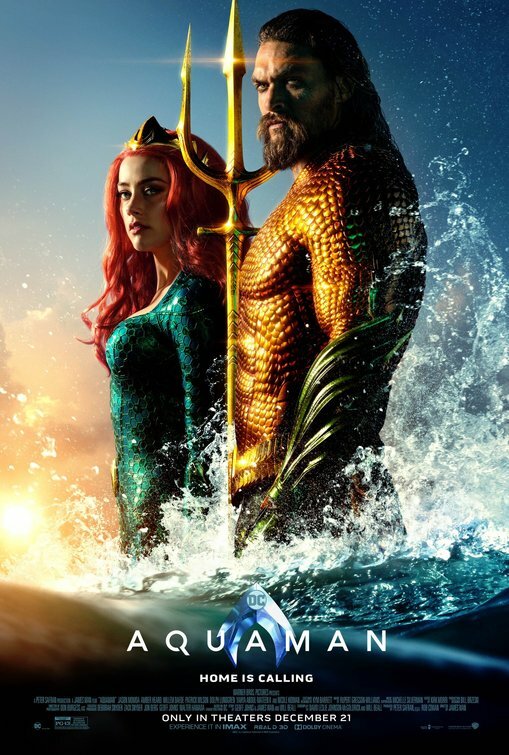 As is always the case for an Anderson film, the trailer is more of an excuse to introduce the slam-dunk cast on board than it is to reveal plot details…I found myself saying “Like him, like her, love him, like him, love her…” as this second preview played on. Highly anticipated to the point where it may not meet expectations, I’m trying to keep a lid on this one until I see it for myself. 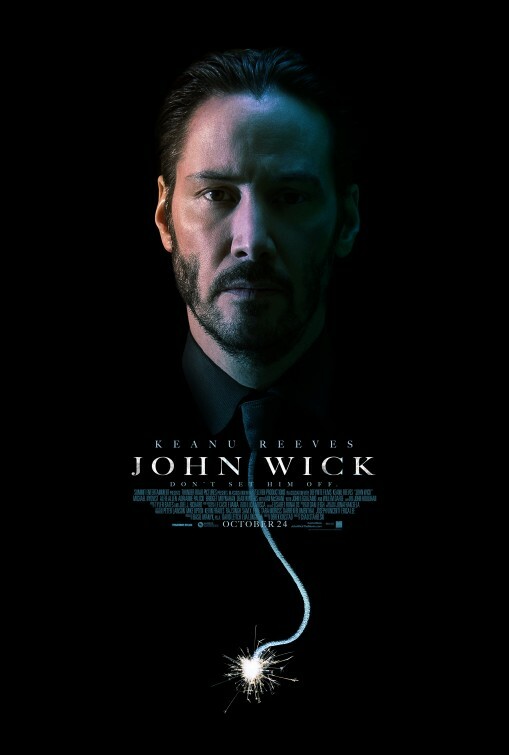 Synopsis: In a California desert town, a short-order cook with clairvoyant abilities encounters a mysterious man with a link to dark, threatening forces. Thoughts: It’s never a good sign when a movie finishes production and then sits on the shelf for over two years. 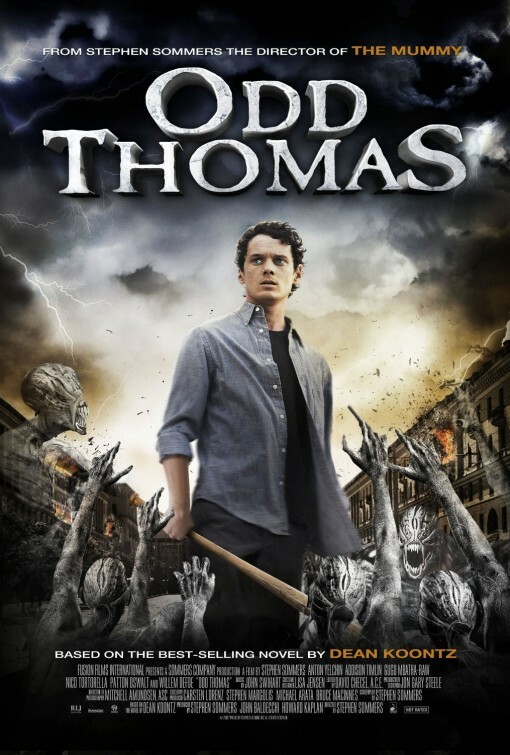 Usually, it’s indicative of a troubled film that the studio doesn’t quite know what to do with but with Odd Thomas legal wrangling between the studio and producers has kept the horror-comedy from making its debut. Now that things are smoothed over it seems fans of the series of novels by Dean R. Koontz will finally get the chance to see the popular character come to life. While I haven’t read the novels, this preview suggests a campy but fun battle between good and evil. I’ve grown to like star Anton Yelchin (Star Trek, Star Trek: Into Darkness, The Pirates! Band of Misfits) and though many of his films are for the lobotomized masses, director Stephen Sommers did hit gold with his update of The Mummy.